England’s choice for post-18 education: Levelling up or down? This guest blog has been kindly written for us by Dr Greg Walker, Chief Executive of MillionPlus, the Association for Modern Universities. Greg has worked in different parts of the tertiary education sector in his career. ‘Too many graduates’, the populist press cry. ‘Too few people qualified in higher technical areas’, the policy wonks insist. The tenor of the current policy debate on post-18 education and the Augar Review is the binary world of ‘Either/Or’. The conventional wisdom for some is to switch prospective higher education students from Level 6 degrees to technical qualification at Level 4 and 5. Surely this would be ‘better value’? Well, not so fast. 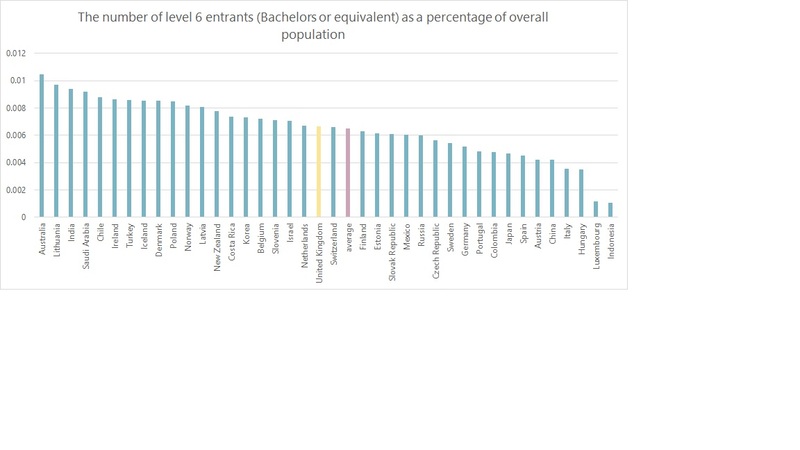 A greater long-term problem for our country is that not enough people are gaining successful outcomes at the gateway Level 3 qualifications (extended Diplomas or A-Levels) by age 25, rather than an ‘overproduction’ of graduates at Level 6. It is this part of the education and skills supply chain that is fundamentally holding us back economically and socially. Fixing it will give us the greatest opportunity to boost our labour productivity as we face the challenge of automation and escalating global competition in a post-Brexit environment. A fundamental flaw in the conventional wisdom is to view higher education participation through a static rather than dynamic prism. This is an educational equivalent of the ‘lump of labour’ fallacy: more for some means less for others. How can we avoid this trade-off? An answer lies in some basic systems thinking, seeing education progression as a pipeline. Key insights here come from a little-noticed report issued by the Department for Education (DfE) last month. The evidence in the report suggests that our fundamental challenge is not the ‘Either-Or’ of progressing our people to Level 4/5 or Level 6, but how we can best enable 16-25 year olds (and those older) to successfully complete Level 3 study. 93,500 students in the cohort who had achieved Level 2 aged 18 did not progress to Level 3 by 25 years of age. This represents an untapped area of potential growth towards Level 3, which would in turn enhance our capacity to boost the number of young people studying at a higher level. I would argue that dealing with this deficit is our critical challenge, promising more fruitful outcomes than a defeatist attempt to disincentivise a proportion of potential students from taking a degree. Most relevantly this will include improved attainment in vocational qualifications, the new T-Levels, and in ‘Access to HE’ courses for learners in their twenties. Modern universities since 2012 have also played their part in ensuring that progression from Level 3 happens smoothly by establishing successful Foundation year programmes that enable thousands of students to attain the equivalent of a Level 3 award, allowing them to move straight into a university degree programme. There is certainly a gap in the take up of higher technical provision at Levels 4 and 5: there is less of this provision than there could or should be. This is a function of a number of factors, key among them is the general decline in part-time higher education study since 2012. Fixing the market in part-time study should help a recovery in ‘sub-degree’ provision – which is mostly designed to be studied whilst in employment. There is a high degree of unity between all those interested in progression to higher education that the high fees regime since 2012 has hit this mode of study particularly, with a 60% drop in those studying part-time. But the answer to this Level 4 and 5 conundrum does not lay in capping aspiration to achieving a full degree by skewing incentives away from this level of study. In fact, pushing provision away from Level 6 and towards Levels 4 and 5 for those who do not wish to engage in work-based higher education might well have negative social ramifications. Prospective students from poorer backgrounds may decide that a ‘cheaper sub-degree’ option will suffice, while middle-class families will happily continue to encourage and fund their offspring into Bachelors-level study. Bachelor’s degrees retain their international recognition as the baseline level higher education qualification, something that is enshrined in key international agreements (e.g. Bologna). Employers value the graduate attributes generated from this level of study. Graduates with a degree still earn a premium over employees with lower level qualifications. From the perspective of students, a university degree generally offers a richer academic student experience including better wrap-around support, careers advice and learning facilities than those offered by, say, Higher National providers offering standalone provision. Higher education participation at Level 6 is, in any case, still behind many of our most advanced international competitors. Despite the turn to populism in the West, the long-term trend globally is to educate and skill people more towards degree level, as the graphic below shows. The ongoing ‘Level 4/5 or Level 6’ trade-off debate in policy circles seems symptomatic of a solution in search of a problem. If we are serious about competing in – and winning – the race to the top of the productivity league, our focus should be more on fixing the foundations of educational progression. Something gone wrong with that chart – numerous countries are in there twice. In An Australian context we have good completion of the final schooling qualification and then high flow on to one of what we call vocational education or higher education (and over time many do both). There is no conflect needed between the two – if we have an issue it is how well the vocational side is working to deliver. The argument that too many are going to HE over Vocational needs to take account of the regional differences: high SES areas have very high HE take up and reasonable poor vocational ; and low SES the reverse – plus a higher proportion doing neither. A serious argument about over take up of HE would have to target school leavers from high SES areas to alter their choices. More realistically the target should be the ‘not in further study’ post school group.